"In an old house in Paris, that was covered with vines, lived twelve little girls in two straight lines..."
Madeline is based on the children’s book series with the same name. 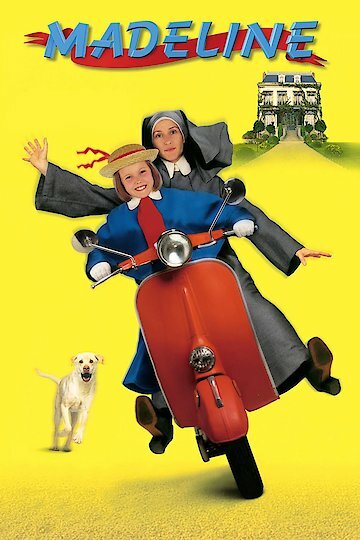 In France, Madeline attends a boarding school headed by a nun named Miss Clavel. Madeline is the only orphan in the school and one day is hopeful that a family will adopt her. Each day, she goes on walks and eats “Chicken Helen”, a meal prepared by a cook named Helen. She also gets into trouble, making it a hardship on Miss Clavel. One night, Miss Clavel checks up on the girls’ room upon getting a strange premonition. She discovers Madeline in pain and quickly takes her to the hospital. Her appendix is removed and Madeline stays the night at the hospital. During her stay, she meets Lady Covington. While the two talk, Lady Covington tells Madeline that she carved her name under her bed. Their conversation is interrupted by Lord Covington, who tells Madeline to leave the room. A few days later, Lady Covington dies due to a serious illness. The Lady’s death is heartbreaking news to Madeline. When Madeline returns to school, she befriends Pepito, the son of an ambassador. Pepito is the target of a kidnapping orchestrated by Leopold. Leopold believes that he would receive money from Pepito’s father if he successfully committed the act. Leopold poses as a personal tutor to Pepito in order to develop trust with the boy’s family. While on her walk, Madeline falls into the Seine River and is rescued by a stray dog. Madeline takes the dog in and names her Genevieve. Back at the school, Madeline nurses a cold and at the same time, tries to keep Genevieve away from Miss Clavel. The nun soon finds out about the dog and explains the rules to Madeline. Pepito and Madeline are later kidnapped by Leopold. They manage to escape while Leopold and his hentchmen were arrested by police. Madeline is currently available to watch and stream, download, buy on demand at Amazon Prime, Amazon, Vudu, Google Play, FandangoNow, iTunes, YouTube VOD online.